ROB STURMA is the editor of FreezeRay, a pop culture literary journal and its print offshoot FreezeRay Press. He has edited Aim For The Head, a zombie-themed poetry anthology and MultiVerse (superhero poems!) on Write Bloody Publishing, and is also the creator and curator of the poetry-meets-wrestling show Extreme Championship Poetry (last seen at the 2014 Individual World Poetry Slam). His new chapbook Why You Tread Water is available from Tired Hearts Press. His work can be seen online currently at Drunk In A Midnight Choir, The Legendary, The Nervous Breakdown, Borderline, Ghost House Review, and on XBox Live. He lives in Oklahoma City, OK, where he co-hosts the Red Dirt Wayward Poets open mic and treats every meal like he’s the Chopped Champion. Check him out at robsturma.weebly.com. 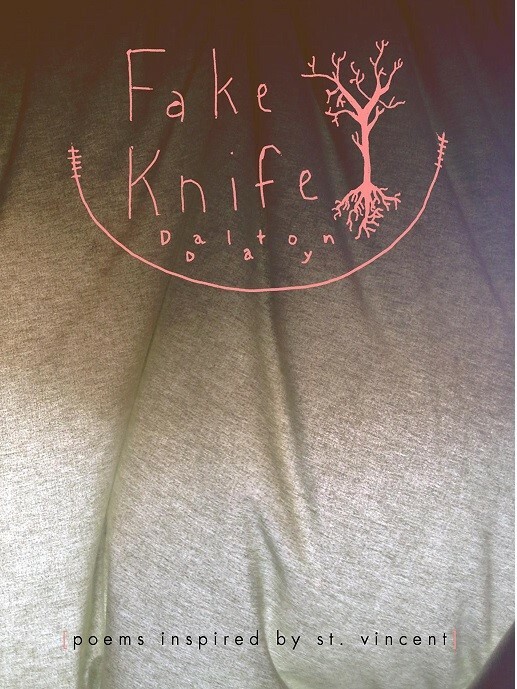 FAKE KNIFE is a collection of poems by emerging poet Dalton Day, inspired by the music of St Vincent.